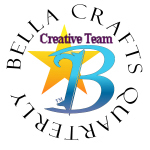 Well, today is the first Monday of the month and that means we’re going to have another fun filled day of blog hopping with the professional designers at Designer Craft Connection!!! 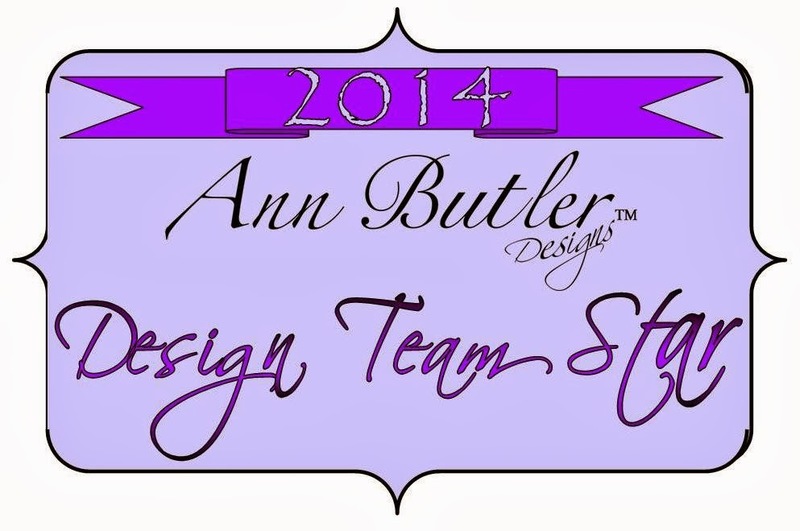 To hop around to all of the designers that are participating in this hop, all you have to do is click on the Designer Craft Connection blinkie on the right side of my blog. That will take you around to all the different blogs. If you find a project that you really like, leave a comment for that designer. We love hearing your thoughts about our work! The theme for this month is Summer Picnics and boy, do I have a project for you! Because let’s face it, if you’re going to have a picnic, you’re going to need a picnic basket and lots of fun goodies to go inside of it. Now, the fun goodies I’m talking about don’t have anything to do with food. Everyone that knows me knows that I don’t cook. I really don’t know how to cook and I know that I don’t ever want to learn, but I can design very cool projects and this is one of those! So, if you’re looking for food, you’ll have to watch the Food Network or do what I do and pick up some sandwiches from Subway, but if you’re looking for a fabulous picnic basket to put your food in, then you’re in the right place!!! 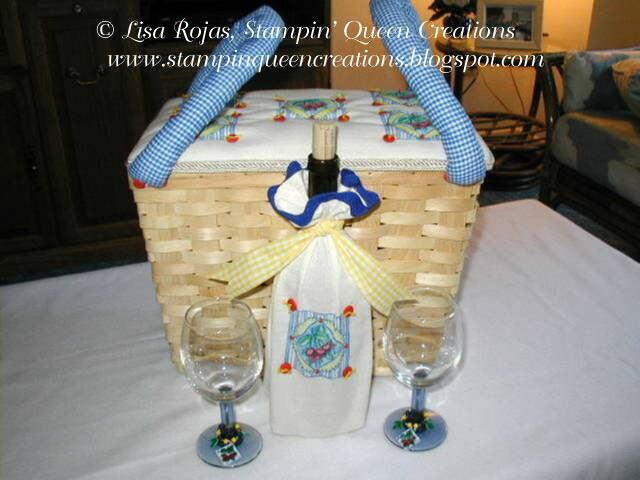 I hope you have as much fun creating this picnic set as I had designing it. When you’re finished be sure to fill your basket with wonderful goodies, grab your loved ones and enjoy a beautiful day at the beach or a park. Have fun!!! Note- If stamps are no longer available; you can substitute them with any stamp that is similar on the market today. There are plenty out there to choose from. Step 1. Remove picnic basket lid. Lay lid on top of a piece of foam core board and lightly trace with a pencil. Cut out foam core board using Creative Versa-ToolÔ hot knife point, following the manufacturer’s directions. Step 2. Lay muslin on top of foam core board and lightly trace around all edges with pencil or sewing chalk. Place muslin on work surface. Apply blue textile paint to Cherries rubber stamp with a foam brush. Stamp image five times on muslin using picture if needed for placement. Designer Tip: If you’re a little nervous about fabric stamping, stamp image five times on a piece of scrap Muslin and cut out with scissors. Lay images onto your large piece of muslin and arrange as desired. When desired arrangement is achieved, simply remove one image at a time, stamp on large piece of muslin. Step 3. Color stamped images with textile paints. For softer shades, dilute paints with water. I experimented with different amounts of water on scrap pieces of muslin. When paints are dry, turn muslin over and heat set paints by ironing. Step 4. Lay batting on foam core board. Cut around edges with scissors. Place muslin on top of the batting, making sure to center stamped images on the batting. Secure the four edges of the muslin and batting together by adding a few basting stitches in each corner with a needle and thread. Step 5. Using a needle and thread, add four red beads on each of the five stamped images. Next, add four red buttons to each corner of the five stamped images with yellow embroidery thread. Lay muslin and batting on top of foam core board, making sure again that the stamped images are centered. Step 6. Carefully turn everything over. Pull edges of muslin tightly over the foam core board and glue in place with glue gun. Turn the completed piece over and glue to the top of the picnic basket lid with glue gun. Adhere trim around outer edges of lid with glue gun. Step 7. For the handles, fold blue and white checkered material lengthwise and machine stitch, leaving a ¼” seam allowance. Turn inside out and stuff. Hand stitch each end closed. Step 8. 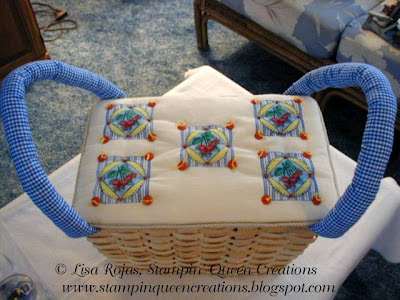 With staple gun, staple each end of the handles to the front and back of the picnic basket. Glue two red buttons on each end of the handles with glue gun. See picture if needed for handle placement. Reattach lid to picnic basket. Step. 1 Apply blue textile paint to Cherries stamp with foam brush. Stamp in the center of the bag. Color stamped image with textile paints. When dry, turn bag inside out and iron to heat set the paints. Step 2. With a needle and thread, sew four red beads on stamped image. Add four red buttons to the corners of the image with yellow embroidery thread. Step 3. Glue blue rickrack to the top of the bag with a glue gun. Insert wine bottle in the bag and tie yellow ribbon around the neck of the bottle. Step 4. Lightly sand shrink plastic and wipe with a clean towel. Apply blue textile paint to the Cherries rubber stamp with a foam brush, being careful to only use the center portion of the stamp. See photo of wineglass charms if needed. Step 5. 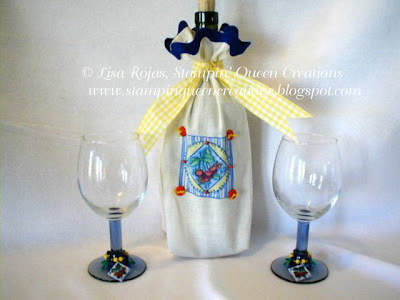 Stamp shrink plastic and color the image with the textile paints. For the leaves, apply green paint to top portion of the leaf stamp with foam brush. Stamp on shrink plastic six times, re-applying paint as needed. Step 6. Cut out images with scissors. Punch hole in the top of each image. Shrink plastic using heat tool. Once Cherry image is cool, add a layer of Aleene’sÒ Paper Glaze. Step 7. Once images are dry, slip jump rings through the holes of each stamped image. 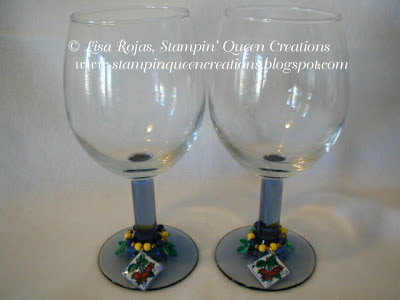 Add charms and beads to gold jewelry hoop and slip around the stem of the wineglass. You are a busy lady! This is a really cute picnic set. Thanks for sharing. Awesome! Love the whole project and really love the picnic top! What a great project; I would love this to take on a picnic! This is a fun project. I'm ready to go on a picnic now! This is a fantastic project!! I have stamped on fabric and made a lovely Easter piece framed in an oval embroidery hoop. You could change this basket out for the different seasons, too!